I knew at the outset that I wouldn't have time to make any of my own assets, so big props to all the people who have made license-able assets available online! I'd love to hear feedback from you—good or bad! Did you like it? Was something broken? Eep, I love this! Super cute and quite fun. I do find that I have to take multiple pictures of the same buns to get a score higher than a C, but still. Very nice work. Thanks! 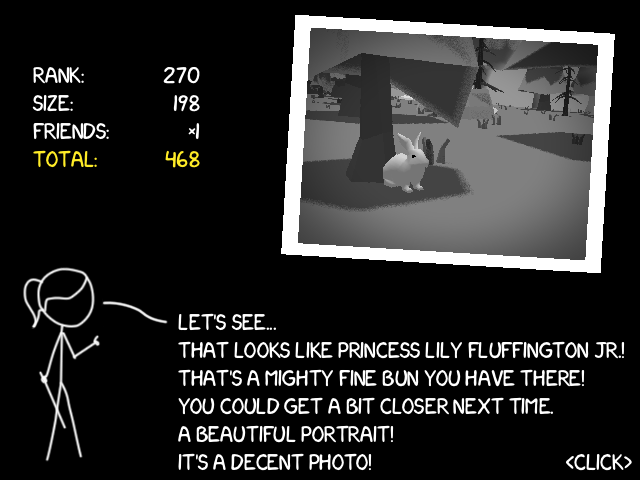 Although it's not clear during the scoring phase, the professor only takes into account your highest-rated photo of each individual bun to calculate the ultimate score (to prevent "cheating" by taking the same picture of the king/queen bun over and and over again). Thanks for checking it out! Thanks! Definitely agree about the moving buns, unfortunately I didn't have time to dive into that. The "friends" value is also a bit nebulous. Unfortunately sometimes there's just no pleasing some professors :P The friends value is a multiplier for if there are multiple buns in the frame. It can be hard to get, but very worthwhile if you can manage it! Thanks! Yea, in hindsight a crouch toggle probably would have been better. I especially ran into this issue when trying to record gameplay footage, but I didn't have time to sort it out! A cute photo taking game, and the implementation of camera snapping and photo scoring is well done! 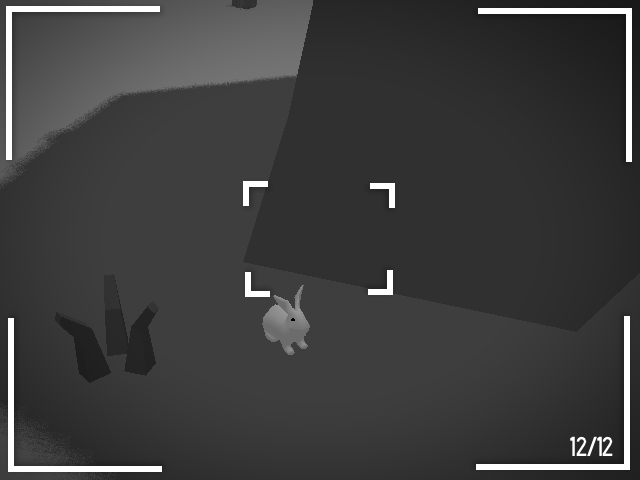 Would be cool with some movement of the buns as I had thought that going up too near might startle them sending them scurrying about, and a mode without a time limit for a more relaxing game. Found King Bun which was super squee. Thanks! 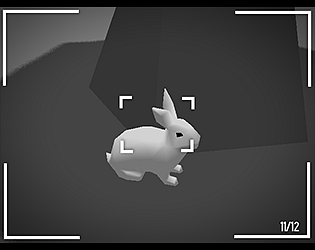 Making the buns skittish would certainly make for a more engaging game experience, I agree! I'm glad you found the King Bun, although there is one in every play-through they can be hard to find! Would love for the buns to move around a bit! You mentioned being unhappy with the mouse controls, so just wanted to mention that they felt perfect to me. Was an enjoyable experience overall, well done. This is pretty cute! 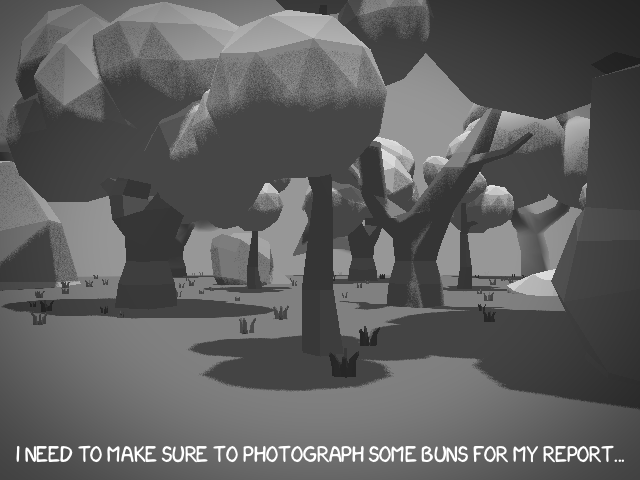 :) It's a nice little game about photographing buns, and that's just a wonderful thing. The assets are well chosen, and I really enjoyed taking pictures. And the names of the rabbits are very cute. Though I found out later that I was scored on rabbit size (which I kinda grasped from the comic) and also closeness to the rabbit (I didn't want to startle them, so I was at least a foot away), which would've been nice to know before I started taking pictures. Also, there is no real sound or music in this game (other than the camera shutter sound, I suppose). It would be nice to have a music track that runs for the duration of time we're supposed to be taking pictures (and also a timer--night fell REALLY quickly once it started to get dark, barely giving me any time to get more pics), and sound effects for "ok", "good", and "great" bun pictures. Perhaps after the jam? But other than those things, I really enjoyed this game. It's a fun little break from life to take pictures of rabbits, and that's quite nice. :) Good job with this. Thanks! There is actually ambient forest noise, but it's quite quiet so you may not have heard it. I considered some music for this, but my composing skills aren't where I'd like them to be in order to couple with the relaxing, almost contemplative pace of the game. I struggled a fair amount with the timer as well; in hindsight I should have changed it to a camera battery dying mechanic, which could display the time left when you have the camera out. It was a peaceful little game. The graphics work well together and I liked the names of the buns. It would be nice if they moved around, or at least had an idle animation. Thanks! Unfortunately I didn't have time to figure out animations, but I agree—that would have added a lot to the game. Thanks for checking it out! Thanks! I'm still not happy with the mouselook controls.. they always feel either too sensitive or too slow, and I can't figure out why. I would have loved to add more interaction and movement with the buns, but unfortunately I didn't have enough time to figure that out. Thanks for checking it out!